If there were a commodities market for intangible goods, consumer data wouldn't trade very far behind breathable air. Physically trading a Vaio for a MacBook or an iPhone for a Moto X is easy; migrating data between those platforms isn't, and that makes for particularly strong platform loyalty. Apple has seen competitors wrest control of its users' data away in recent years, and the company is responding to the threat with a number of new features and pricing changes that are good for both consumers and developers. Users have long lampooned Apple for its relatively stingy approach to doling out storage allowances. Each iCloud account comes with just 5 gigabytes of disk space by default, an amount that's easily eclipsed by normal users, especially those who make heavy use of the iPhone's camera. Apple's upgrade options are equally vexing: $20 per year adds just 10 gigabytes of additional space, with $40 netting another 10 gigabytes and $100 adding only 30 gigabytes more, bringing the total allowance to 50 gigabytes. That same $100 per year would buy twice the space —100 gigabytes —from Dropbox or Box.com and an extra $20 would bring a whopping 1 terabyte from Google Drive. iCloud's storage limits were marginally defensible when the service was limited to synchronizing data from iOS and Mac apps. With iCloud Drive, however, Apple is pitting iCloud against a horde of firmly-entrenched competitors and has rethought its pricing strategy. With the launch of iOS 8 and OS X Yosemite, the base storage allocation will remain at 5 gigabytes. Upgrading to 20 gigabytes will cost just $0.99 per month, though, with 200 gigabytes coming in at only $3.99 per month. Additional tiers of up to 1 terabyte will be available, but their pricing hasn't been announced. 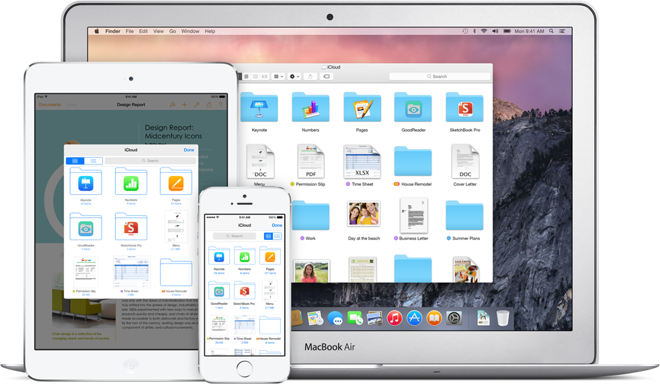 Those costs put iCloud Drive in an excellent position on storage space alone, but it shines yet brighter over its competition when considering iCloud's seamless integration with Apple's devices. The budding iCloud.com suite —which includes web-based versions of Numbers, Pages, and Keynote —adds even more value. Developers can also take advantage of iCloud Drive to store and synchronize documents and data for their apps, but they've got a service all their own: CloudKit. CloudKit is a new, "effectively free" service that lets developers store users' data in the cloud with asset storage (for things like photos) as well as database space. There are a number of other advantages for developers adopting CloudKit, but Apple's generous storage allowances are the tentpole feature. Apps start out with 5 gigabytes of storage for assets and 50 megabytes for database; each additional user adds 100 megabytes of asset storage and 1 megabyte of database space. Data transfer is included as well, starting at 25 megabytes per day for assets and 250 kilobytes per day for database. Those are bumped up by 0.5 megabytes and 5 kilobytes, respectively, per day per user. 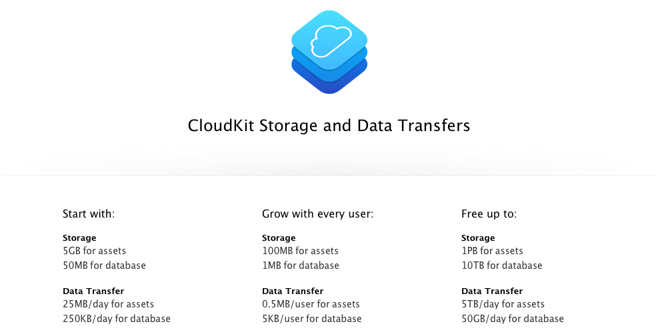 CloudKit's top asset storage tier would cost tens of thousands of dollars per month from other vendors. Apps can store up to a petabyte of assets and 10 terabytes of data while transferring 5 terabytes of assets and 50 gigabytes of data each day —for free. The asset storage and transfer alone would cost developers at least $40,000 per month if they used Amazon's Simple Storage Service. There is one catch, of course: since iCloud is tied to iOS, apps will either need to stay exclusive to Apple's platform or build with more than one storage backend in mind. With the mobile wars heating up, it will be a difficult decision -- but Apple has given them hundreds of thousands of reasons to consider it.